A lot of adoption campaigns rely on adorable photos of fluffy, furry, wee little whiskered faces that tug on your heart strings and spur you into action. The Calmar Fire Department might have a little bit of a hard time getting a really cute photo of their "adoptees," but, none-the-less they are still hopeful that town residents will look deeper than beauty, which after all is only skin deep, and take this adoption program to heart. On Monday February 3rd, Calmar Council approved the new Adopt-A-Hydrant program. Proposed by the Calmar Fire Department, this program is designed to raise awareness of the importance of fire hydrants and as a secondary benefit, could also be a way of beautifying the town. How the program works is that a family, group, or individual could choose to "adopt" the fire hydrant outside of their home, business, school or any place within Town limits, and then place a call to the Fire Hall to ensure that particular hydrant has not already been adopted. If it is available then the hydrant is registered in the adoptees name and that person/group will receive an adoption certificate for "their" hydrant, and their name will be entered into the Fire Dept's Adoption Log on their website. After the adoption has been registered, it is then the adoptees responsibility to "take care" of their hydrant. That can take on a variety of meanings depending on the level of involvement that the adoptee desires. It can be as simple as just keeping an eye on the hydrant to report any damage or leaks that occur, or for people who want to take it to the limit, they can ensure any trash around the hydrant is always picked up, that the hydrant is kept visible and accessible at all times including clearing the snow from around the hydrant in the winter time, and with design approval from the Calmar Fire Dept. 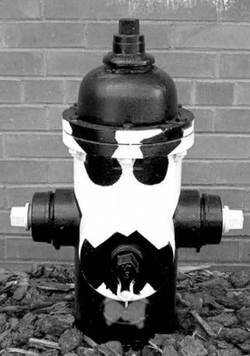 adoptees can even turn their hydrant into a work of art by painting it! There is no cost to adopt a hydrant other the the price of paint should an adoptee decide to decorate their hydrant and the Town of Calmar is still responsible for the maintenance, testing, and clearing of snow from the hydrants. "We are just hoping to make everyone more aware of the importance of our fire hydrants." said Fire Chief David Brooks. "Right now the Town is doing everything to take basic care of the hydrants, but something as small as a little extra snow clearing in the winter could make a big difference if there was an emergency." This is a similar program to other Adopt-A-Hydrant programs that have been instituted in various towns across Canada and it has proven to be very successful when residents take ownership of the program. It can be a real source of pride and even a draw for tourists to have most of the fire hydrants in town painted to look like dogs, ducks, Santa Claus, space creatures or whatever the imagination can come up with. But if an adoptee would simply like to spruce up their hydrant at no cost then the Town will supply the standard colour paint as is normal. This program is also a big help to a town's Fire Dept. to know that they can access a hydrant very quickly should an emergency occur instead of arriving to find a hydrant buried in trash or having to waste precious minutes digging it out of a snow bank. In a show of support for the program, the first hydrant in Calmar has already been adopted by Mayor Faulkner who is now committed to caring for the one closest to his home. Adoption commitments are for a term of one year so for those who are interested in participating in the Adopt-A-Hydrant program, please call the Calmar Fire Department at 780-985-3500 for more information.